What job is a Blackberry hired to do? When mobile platforms are discussed, the conversation frequently turns to market share battles between Android and iOS. I’ve pointed out before that the problem with this reasoning is that market share in a market that’s growing at 90% is a false measure of performance. The more important measure is how much of the non-smartphone market is being taken by smartphones and how fast the whole phone market is growing. 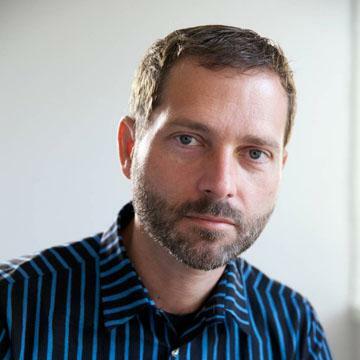 Competition with non-consumption is very different from platform warfare. But even when discussing the rivalry between current platforms, the Blackberry and Symbian are often overlooked as contenders. Windows Phone and iOS come in and out of discussion only on the basis of press releases. The truth is however that Symbian, Windows, Blackberry are not going to disappear anytime soon. Why is that? Following up on survey data showing that up to 25 percent of Americans have moved to smartphones, here is another survey (Comscore) which shows that US smartphone users are at about 23 percent. Comscore also surveyed European countries, and we can compare the popularity of smartphones vs. the US. I also indexed the share to population to show the relative populations of smartphone users across these countries. It may come as a surprise to some that smartphones are more popular in the UK, Spain and Italy than in the US. Considering that these are countries with lower levels of disposable income, and that in Italy and Spain pre-paid plans are overwhelmingly more popular. Buyers in those countries are much more likely to pay full, unsubsidized prices plus 20% or more VAT. Overall the price differential for an Italian buying a smartphone vs. an American is likely to be a factor of 5. It gets even more peculiar when you consider that many Italians have more than one phone, with overall phone line penetration above 100%. The explanation for this remarkable appetite for smartphone goodness is the early lead that Symbian had in Europe. Buyers who entered the phone market ten years ago became accustomed to upgrading their Nokia phones. Symbian phones were aspirationally positioned as feature-rich camera and messaging devices. Many were also purchased without data plans and were thus used as high-end feature phones. In other words, consumers in those countries were comfortable paying full price for unlocked Nokia devices and using them with multiple SIM cards. The data points to how normative behavior evolved and how different that can be even among culturally aligned Western nations. When looking at Asia and South America, it gets even more interesting. Whereas in Europe it was Symbian, in the US RIM got the ball rolling. The contribution of these platforms in shaping expectations, not to mention pricing, for the iPhone and Android should be noted. It’s hard to get excited about the new RIM Blackberry Torch. It’s not exciting in a positive way and not exciting in a negative way. It’s just more of the same and the same is not all that bad. Then again, the same is not all that good either. Every piece of the Torch product is playing catch-up with others’ innovations without enhancing the core innovation RIM itself brought into the market years ago. The problem seems to be that, like in Palm’s case, mobile computing is a game for big companies. If you ask why Palm and RIM became uncompetitive you get two different reasons. Palm could not do hardware and distribution well and RIM can’t do software well. But these reasons have remedies which neither company can bring to bear: resources and processes. Palm did not have the resources for distribution and production and RIM did not have the processes to be a software platform company. Their values and priorities are adequate but competitiveness today, in this market, requires projecting market and development power. I can only conclude that RIM is simply too weak to make it in the long run. Much has been made of the potential for Android to reduce the growth of iPhone. The iPhone seems to be doing very well and continuing to be supply rather than demand constrained. RIM however seems to be under significant pressure. A Goldman Sachs analyst first pointed this out in her last report and placed a “Sell” on RIMM. The fact is that most of RIM’s sales are in the US on the carriers other than AT&T. In those very same carriers, Android is being pushed hard as a customer retention strategy, so iPhone is pressuring RIM only indirectly through Android. The evidence is also in survey data. 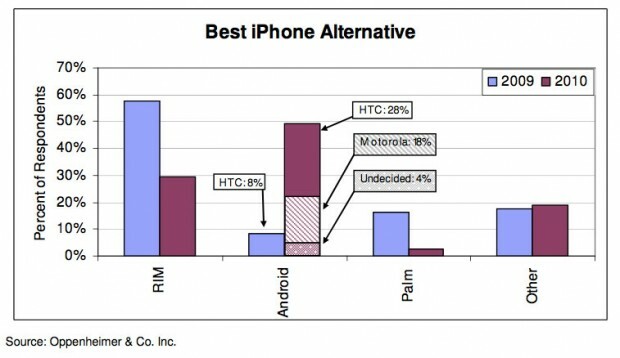 In the graph below, we see how iPhone buyers are considering Android as the most credible alternative to the iPhone whereas they considered BlackBerry the best alternative a year ago. In terms of vendors, what RIM lost HTC gained. One can only wonder what will happen when the iPhone enters unrestricted distribution in the US. The results in other markets speak for themselves. AppleInsider | Apple’s recurring revenue stream: 77% of iPhone 4 sales were upgrades. Following up on my last post on how misleading US-only share comparisons can be, I decided to draw charts to visualize the comparison. As Android and iPhone compete in various ways, it’s hard to see which is the preferred choice given a direct comparison. In other words, iPhone and Android devices rarely are placed next to each other with similar terms. Take the US market for example. The overall data from NPD suggests that last quarter Android reached 28% share vs. 21% for iPhone. Many of those Android devices were new to market or at least newer than the iPhone which in Q1 was coming to the end of its product cycle. Second, pricing for Android devices seems to have been quite aggressive with buy one get one free sales. But I won’t dwell on tactics now; what I do want to note are the differences in share between AT&T users and non-AT&T. 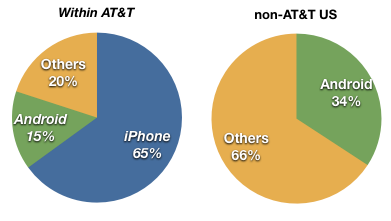 Note that within AT&T, iPhone outsells Android over 4 to 1. iPhone also outsells “others” (mainly RIM) more than 3 to 1. However, outside AT&T, where the iPhone is not available, Android does not outsell “others”. 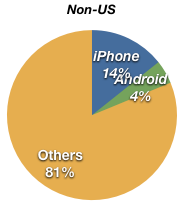 If we exclude the US altogether, we also see that Android does not have a great distribution. Outside the US, the iPhone also outsells Android nearly 4 to 1, but it has a way to go before challenging Symbian which makes up the bulk of “Others”. So in markets where Android is head-to-head with the iPhone (AT&T and non-US markets), iPhone’s lead is quite high (still). The possibility still exists that Android will overtake iPhone given the broad licensing and distribution, but it’s not necessarily a given. And in any case, iPhone is not the market share leader today and that leadership does not seem to be their objective (note the pricing). The bigger question is what will happen to RIM and Symbian as Android grows. These numbers are shipments or sell-in, which may differ from sell-through or end-user purchases. RIM breaks into top 5 in surging phone market | Reuters. Strategy Analytics said 54 million smartphones were shipped in the quarter, comprising 18 percent of the total handset market. Apple’s share reached 16.4%, up from 10.6% a year ago while maintaining an ASP of €445. Nokia raised its share to 40% from 38.2% on an ASP of €155. RIM slipped to 19.7% from 20.3%. via Smartphone Q1 shipments up 50 pct y/y -survey | Reuters.